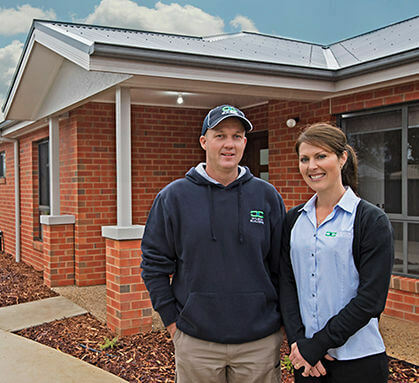 Chris and Clare Wilson established C & C Wilson Builders in 2005. We construct domestic and commercial buildings across Country Victoria for the past 20 years. We have worked all across the state, servicing areas including Shepparton, Nathalia and the Goulburn Valley area. Attention to detail is standard at C & C Wilson builders and not an additional extra. We offer expert advice on both the structure and style of your home and deliver unique quality homes that suit individual lifestyles. During these years we have built a reputation for outstanding building quality and exceptional service. We understand that your home is possibly the biggest investment you will make, so we take the time to make sure we get it right and communicate through the entire construction of your home. C & C Wilson Builders guarantees that your home will be completed on time, on budget and will showcase our quality workmanship.